As a Professor of Geology and Environmental Science at Northern Arizona University, Darrell Kaufman has been studying past climate changes in Alaska over the last 20 years. His current research is aimed at using evidence from previous climate changes to help understand present and future climate changes. Professor Kaufman is also coordinating a large multi-investigator project to generate and compile proxy climate records from Arctic lakes. A recent study for which Professor Kaufman was the lead author had a look at the trend in Arctic temperatures over the last 2,000 years by using data from lake sediment cores, tree rings, and ice cores to reconstruct temperatures in the Arctic on a decadal (ten-year) time scale. The study concluded that the Arctic saw a general cooling trend from the first century until the middle of the 20th century, after which average temperatures in the Arctic began to rise abnormally outside of expected natural variation, with the last decade being the warmest decade over the 2,000 years. The sudden dramatic rise in temperatures is believed to be caused primarily by the accumulation of anthropogenic greenhouse gas emissions in the atmosphere. In this interview, Professor Kaufman goes into greater detail about the methods used to reconstruct Arctic temperature history. He also responds to some criticism directed at the study. The data you used in your synthesis study was obtained by examining lake sediment records, ice core records, and tree rings records from all across the Arctic. What criteria did you have in choosing the records you used? We included all available proxy temperature records from the Arctic and Subarctic that went back beyond 1,000 years and were resolved on at least a decadal scale. Of the 23 records, 14 were from lakes. How far back in time do lake sediment records go? Until the end of the last Ice Age? That's right. Most of the lakes in the Arctic were covered by glacier ice up until 14,000 years ago or even more recently. So the sediment within the lake can extend through the entire Holocene (the current interglacial period). Our ability to reconstruct temperature that far back decreases in some cases because other factors can bias the results. Further back, other variables such as vegetation changes and landscape processes that take place over long periods of time become important in influencing the proxy climate records. Inferring temperature changes from lake sediments is a major research project. It takes a lot of effort to understand how the various biological and physical features that we analyzed in the lake sediment are related quantitatively to temperature. What does one look at in lake sediment records and what can it tell you? Several of the records included in the synthesis are based on indicators of the overall biological productivity of the lake. The primary producers in Arctic lakes are diatoms, and the sediment preserves the remains of the diatoms that grow each year. We can relate the abundance of diatom remains from a given year to how warm the summer was that year. Warmer summers are associated with longer open-water periods, which allow more diatoms to bloom. Changes in the abundance of diatoms that grew over the last 50 or 100 years and are preserved close to the surface of the sediment at the bottom of a lake can be compared with temperatures from nearby weather stations. We can then apply this calibration down the entire sediment core to infer the changes in temperature that took place prior to thermometer-based records. Besides diatoms, do you use any other kind of proxies when looking at lake sediment? We also studied sediment layers from lakes downstream from glaciers to reconstruct past temperatures. If a given summer is hotter, glaciers generate more meltwater, and meltwater carries sediment to lakes downstream from them, resulting in a thicker layer of sediment. The warmer the summer temperatures, the greater the thickness of sediment deposited in the lake downstream from the glacier. Where did you get ice core data from and how did you integrate the ice core data into your synthesis? 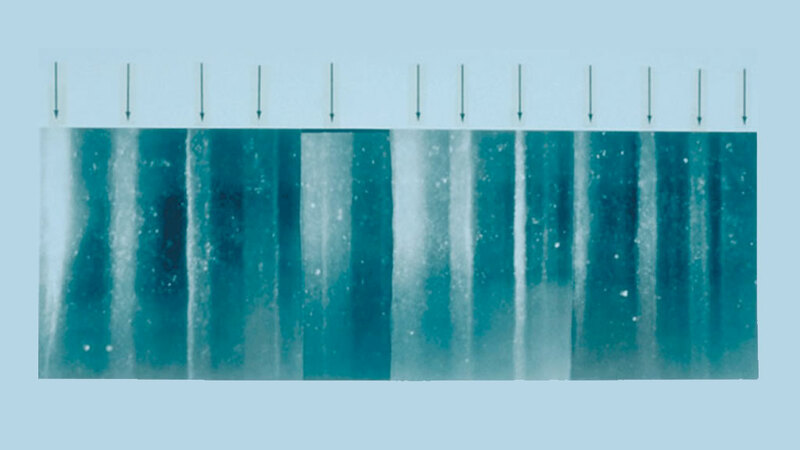 All of the ice cores had been drilled and analyzed before we made our synthesis. Ice at least as old as 2,000 years has only been found in a few places in the Arctic, primarily Greenland and the Canadian Archipelago. The longest, highest-resolution records of climate change on Earth come from ice cores. The primary proxy used for reconstructing past temperatures from ice cores is based on the ratio of two different isotopes of oxygen: oxygen-16, which is the most abundant isotope of oxygen, and oxygen-18, a much rarer and heavier isotope. The colder the temperature during a given period, the less oxygen-18 there is in the water molecules of ice. Taking measurements of modern snowfall allows you to calibrate the measurements taken from ice cores. As for the tree rings, one would imagine their records can only go back so far? That's right. Most proxy temperature reconstructions are based on tree rings, and most don't go back beyond a thousand years. The previous attempt to reconstruct past Arctic temperature at such a high resolution only went back as far as 400 years, because it relied mostly on tree ring records. Our new records from lakes help us understand the temperature changes that took place during the first millennium AD. So how do you get tree ring data going back over 1,000 years? These records don't come from individual tress; they're spliced together from different trees, including some from dead stumps and sub-fossilized wood that are older than any living tree in the region. You can match patterns in the ring widths using trees whose lifespans have overlapped and match the most recent growth of an older tree to the oldest growth on a younger tree. Then you can splice the records together to go back beyond the lifespan of any living tree. The study has been published only recently yet some bloggers were quick to criticize the work. What has some of this criticism been? Some bloggers have accused us of "cherry-picking" the data we included in our synthesis, which is a shame because we went out of our way to include every record that we know of that met the criteria of the study. A Washington Post article quoted a climate-warming skeptic who claimed that our results were incorrect because the temperatures that we reconstructed were not higher during Medieval Warming Period than during the 20th century. We know that temperatures were high in a few places during some decades of the Medieval Warming Period. But our study was aimed at reconstructing the average temperature from across the Arctic, which is bound to be less variable than at any one particular spot on the planet. Pointing to evidence for warmth in a few places is not the same as reconstructing the average temperature over a large area. Unfortunately, some people seem to be more interested in defending a particular ideology than in examining the validity of the science. Darrell Kaufman is a Professor of Geology and Environmental Science at Northern Arizona University. His research interests focus on geologic records of environmental and climatic changes that took place during the recent past in order to help understand present and future climate changes. More specifically, he studies climate variability from Arctic lakes, climatic records from southern Alaska lakes, sedimentary records of environmental change, and amino acid geochronology. Professor Kaufman is also coordinating a large multi-investigator project to generate and compile proxy climate records from Arctic lakes.